The National Security Agency and the Department of Homeland Security has named Syracuse University a National Center of Academic Excellence in Information Assurance-Research (CAE-R). Other prestigious universities that also received the distinction include the Air Force Institute of Technology, Carnegie Mellon University, the Georgia Institute of Technology, the Naval Postgraduate School and the University of Maryland at College Park. The CAE-R designation was awarded at the 13th Colloquium for Information Systems Security Education in Seattle. 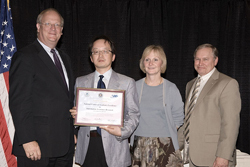 Syracuse iSchool Professor Joon S. Park traveled to the colloquium in Seattle to accept the honor on behalf of the information assurance (IA) faculty at SU. The designation was formally presented by David Wennergren, deputy CIO and assistant secretary of defense for Information, Management and Technology at the U.S. Department of Defense; Brenda Oldfield, director of Cyber Education & Workforce Development at the National Cyber Security Division of the Department of Homeland Security; and Richard George, information assurance technical director at the National Security Agency. The National Centers of Academic Excellence in Information Assurance Education (CAE-IAE) and CAE-Research (CAE-R) programs are jointly sponsored by the National Security Agency and the Department of Homeland Security. The goal of these programs is to reduce vulnerability in our nation’s information infrastructure by promoting higher education and research in IA and producing a growing number of professionals with IA expertise. Four-year colleges and graduate-level universities are eligible to apply to be designated as a CAEIAE. Applicants must pass a rigorous review and demonstrate their commitment to academic excellence in IA education. To apply for designation as a CAE-R, applicants must meet the Carnegie Foundation’s classifications of research university/very high, research university/high and doctoral research university, or the equivalent. Designation as a CAE-IAE or CAE-R is valid for five academic years, after which a school must successfully reapply in order to retain its CAE designation. CAE-IAEs and CAE-Rs receive formal recognition from the U.S. Government as well as opportunities for prestige and publicity for their roles in securing our nation’s information systems. Students who attend these designated schools are eligible to apply for scholarships and grants through the Department of Defense Information Assurance Scholarship Program and the Federal Cyber Service Scholarship for Service Program. SU was originally designated as a Center of Academic Excellence in Information Assurance Education in 2001 and redesignated in both 2004 and 2007. This is the first time that SU has received a CAE-R designation.